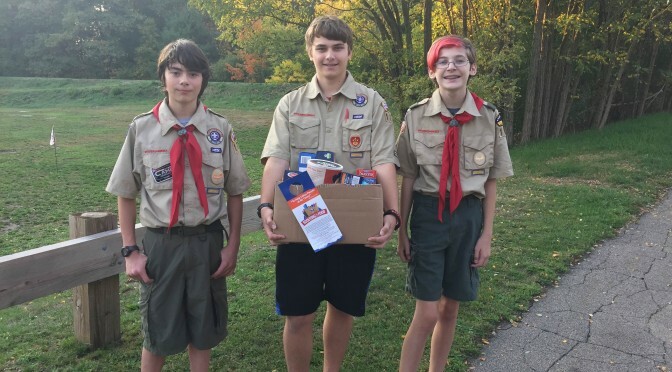 Troop 1775 Natick Scouts Jared, Connor and Travis are ready for their 15 minutes of fame! 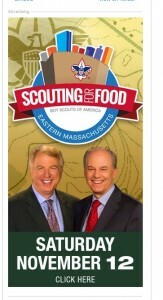 They are appearing in a :30 Public Service Announcement for Scouting for Food on WCVB Channel 5 Boston! The spot will also feature appearances by WCVB’s own Harvey Leonard and Mike Wankum. Check our page in the coming days, we’ll post it here! For the third year ABC’s Boston station WCVB/Channel 5 is partnering with the Boy Scouts as our 2016 media sponsor. Channel 5 will be covering Scouting for Food with public service announcements featuring Harvey Leonard and Mike Wankum along with web and mobile messages, raising awareness for the food collection dates. Also look for our morning ‘Wake Up Call’ on the Eye Opener News on November 9 and live coverage on November 12th!